Very nice!! Wonder what one of those would set you back? KarateKid25 wrote: Very nice!! Wonder what one of those would set you back? Well....from what I've been told the RRP will be around $1,995....which I think is quite reasonable. Yeah it's reasonable. I was kind of expecting a higher price tag actually. Maybe $2500 or so. I like the JB4, but honestly I'd prefer it if they made a more 'modernized' bass. ROON wrote: I like the JB4, but honestly I'd prefer it if they made a more 'modernized' bass. I have to agree with you there. 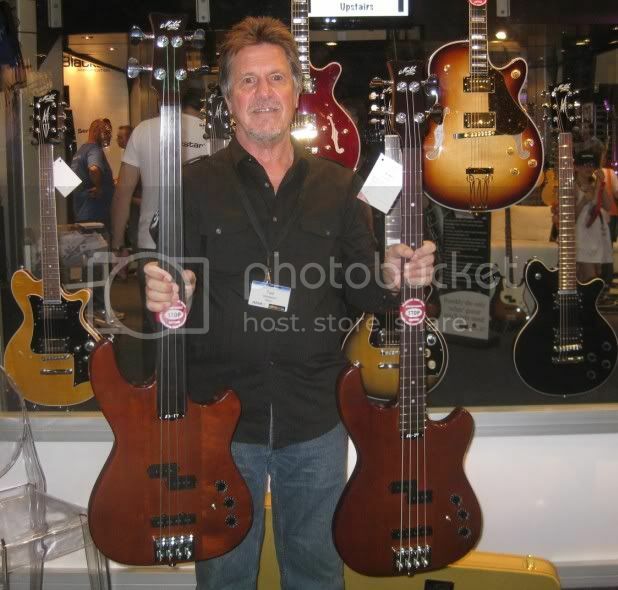 Look at the effort that has gone into some of the guitars behind Ted and then look at the JB and I can't help feeling that the Maton basses are not a primary interest. I now they are great instruments but they certainly aren't chasing the same level of innovation or complexity they put into guitars. Nice reporting Ivan !!!.. Do you know if they are still using Dimarzios ? If they are DiMarzios (don't know), they're definitely not the DP123 style DiMarzios that they used to put in. The DP123 have adjustible pole pieces, these don't. NotTheFish wrote: Nice reporting Ivan !!!.. Do you know if they are still using Dimarzios ? This may be the case....I'll reserve my comment though. I saw these at AIMS too. Pretty much identical to the original JB4. One point of difference between the new and the old is the wood used for the body. Apparently sassafras was to hard to source for the new ones so they are using something else ... i can't remember what it was though. Classic5 did you happen to note the wood for the body? I believe the neck/fingerboard is still the same though - maple/ebony. Will be interesting to see how they sound compared to the original ones. I can see a fretless JB4 in my future. No fretlines is no big deal if they have dots on the top of the neck. I had a Godin 5 string with no lines , practised with it for 2 hours the day I got it then went out and played a gig with it. EUB was harder it took 2 weeks till I played a gig with that one. I agree bugsy, probably will mean the tax concession as there were no aussie manufacturers will be gone too. BenC wrote: I saw these at AIMS too. Pretty much identical to the original JB4. One point of difference between the new and the old is the wood used for the body. Apparently sassafras was to hard to source for the new ones so they are using something else ... i can't remember what it was though. Classic5 did you happen to note the wood for the body? I believe the neck/fingerboard is still the same though - maple/ebony.